The look is moist and light. The feel is like a second skin. 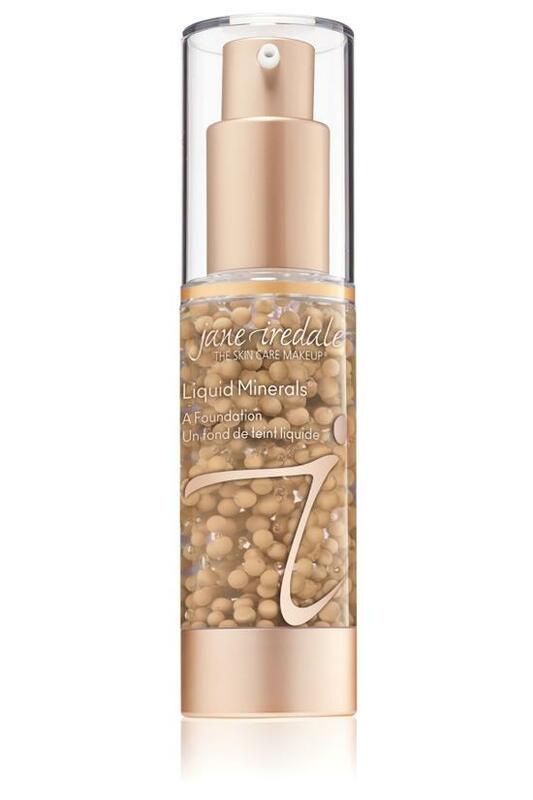 Jane Iredale's Liquid Minerals is a light-reflecting, mineral foundation in a special liquid formulation. The beads are actually Liposomes entrapping Liposomes. This state-of-the-art technology enables us to encapsulate large amounts of active ingredients, which are then time-released into the skin. The spheres are suspended in a gel of Aloe Vera and Vegetable Glycerin. Makeup and skin care in one bottle! Apply Liquid Minerals with our Foundation Brush. The first few pumps will release a clear gel. This is aloe vera. Rub it into your hands; it's good for them. Two pumps of Liquid Minerals on the back of your hand are usually enough to cover most of your face. Pick it up with the dry Foundation Brush for a heavier coverage. Wet the brush for a more sheer coverage. Brush Amazing Base or PurePressed Base on top of Liquid Minerals for broad-spectrum sun protection.